This is a really satisfying and flavour-packed meal which I cooked last night in my recently acquired pressure cooker, a piece of kitchen equipment that I’m rapidly falling in love with. (NB: You can get perfectly good and very much cheaper PCs than mine – I just opted for what looked like a ‘foolproof version’ because I was nervous about the whole idea of pressure cooking)! In this recipe, cooking time is reduced to 25 minutes in the PC. If you want to try this recipe using another method of cooking, it takes about 2 hours in the oven at 180°C / 350°F / Gas Mark 4, OR 5-6 hours in a slow cooker. Oven on (if using a traditional oven). Toss the beef in the flour to coat. I do this by putting the meat and flour in a zip lock bag an tossing it around. Heat the oil in the open pan and brown off the beef in small batches, setting it aside when done. Add the onions, bacon / spicy sausage and garlic to the pan and cook until the onions have softened (3-4 minutes). Add back the beef + potatoes, tomatoes in juice, carrots, stock, wine, paprika, bay leaf and caraway seeds if using. *Put the lid on the pressure cooker and lock it in place. Set the pressure to high (‘meat’ setting on my PC), bring to pressure and cook for 25 minutes. When done, release the pressure slowly (take the pan off the heat and let it stand for 10-15 mins – this allows the flavour-infused steam to meld back into the cooked dish). If using, add the peas or beans to the opened pan and cook through for 4 to 5 minutes. To serve: top with a little sour cream. Can be had with crusty bread or rice, although we found this to be a satisfying ‘one-bowl’ meal on its own. 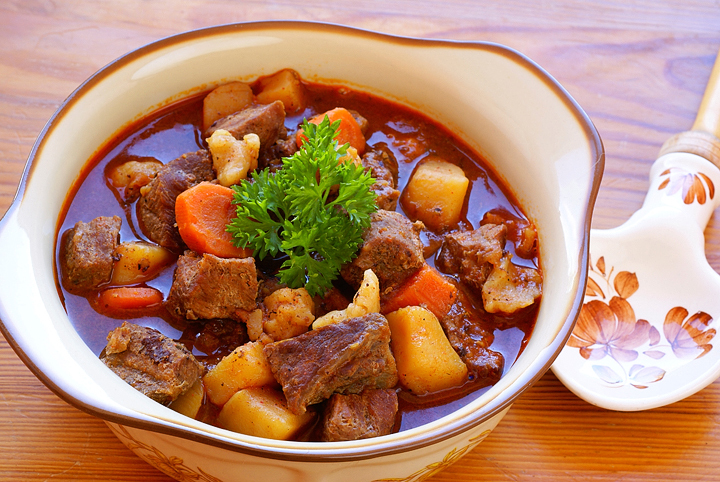 *If using a traditional oven, cover the casserole and cook for the required time (2 hours or until the meat is tender).